Why is passing so great anyway, how do I know if you’re a ‘real’ activist, and why do I start acting so butch in those protest marches? “Normativity” is one key problem with many existing conceptions of solidarity, since I have always personally felt that the essence of avant-garde poetry is somehow connected with the idea of language against heteronormativity. So going back to the Foucault reference, one notion was to find out where a critique of the self and a critique of heteronormativity would dovetail together. Did the word “poets” occur to you while reading that passage? I rest my case. In this situation, negotiating the complex processes of performing, passing, critiquing, cruising, camping and being brings the emphasis dramatically onto language itself as material, as a site in which critical negotiations and thinking about queerness are constantly enacted. With this journal I wanted to explore the ways in which language, not just authors, could be queer. With these ideas in mind, I sought out a number of poet-friends who have experience with such concerns: CA Conrad, kari edwards, Paul Foster Johnson, Erica Kaufman, Jack Kimball, and Stacy Szymaszek. I invited them to be co-editors of this project and to each solicit work from about 10 poets whose work they feel is involved in “queering language.” My other request was that each editor then write an editorial statement explaining their choices and how they interpreted the title of the issue. I am really delighted with the hard work done by everyone and with the result you see before you, which features over 100 contributions including some rare and unexpected items. We ended up with many diverse takes on what “queering language” might suggest and what kind of work it evokes as well as what kind of a poetics it might imply. I am so pleased to have the opportunity to work with these wonderful people, and the result is beyond what I ever could have imagined. Special thanks also to Nathaniel Siegel and Stacy for their help in setting up a reading launch event celebrating publication of the journal, and thanks to Christina Strong for website assistance and many hours coding together like crazy in my apartment. Unfortunately, just as we were putting the finishing touches on this gigantic project, we suddenly received the news on December 3rd that our co-editor kari edwards had suddenly and unexpectedly died of a heart attack. kari was a very important friend, mentor, and fellow traveler in my life, someone who I looked up to and tried to emulate, and I was totally devastated by this news – we all were. In retrospect, it was decided to dedicate the journal “Queering Language,” to kari who was so courageous, so uncompromising, so knowledgeable, and so central to helping us to understand both what queerness can be and what language can do. We will dearly miss this very talented and powerful poet, and we honor her memory. Enclosed here please find the queers, the trans, the inter-, the unregistered bodies, the hetty hetty bang bang, the evaporating and condensed voices, and most of all a poetry that will not closet desire. Tim Trace Peterson is a poet, critic and editor living in Brooklyn, NY. 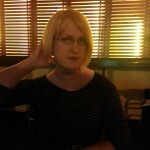 The author of Since I Moved In (Chax Press) and Violet Speech (2nd Avenue Poetry), Peterson also edits EOAGH: A Journal of the Arts and curates readings and events throughout NYC including the TENDENCIES: Poetics & Practice talks series at CUNY Graduate Center and the Zinc Bar reading series. Other chapbooks include CUMULUS (Portable Press at Yo-Yo Labs) and Trinkets Mashed into a Blender (Faux Press/e). To learn more about Peterson visit her blog here and listen to readings from Queering Language here.